As a member of the Emergency Disaster Preparedness Committee for the Palo Alto Neighborhoods Association, PAN, I strongly recommend you review the following information. Basic services such as electricity, gas, water, sewage treatment, and telephones may be cut off for days, or even a week or longer. Or, you may have to evacuate at a moments notice and take essentials with you. You probably will not have the opportunity to shop or search for the supplies you need. A wealth of Emergency Preparedness information including local emergency telephone numbers and useful web links have been gathered together at www.paneighborhoods.org/ep. I suggest you read Are you Ready? an in-depth guide to citizen preparedness at www.fema.gov. Children can be very frightened during an emergency and will need special attention. What do you do to protect your pets? This FEMA site provides brochures and suggestions on how to cope with the effects of a disaster. Also visit the American Red Cross, Palo Alto Area Chapter at www.paarc.org for a schedule of local presentations that discuss these topics. Did you know there were three pandemic flus in the last century with more people dying of the flu than were killed by all of the wars combined in the 20th century. During the next pandemic, it is projected that 253,000 people are expected die in California alone, and 10,713,000 people are expected to fall ill in the state. Go to www.fluwikie.com or www.sccphd.org to learn about pandemic flu and the measures you can take when it happens again. Yours truly presenting disaster kits. 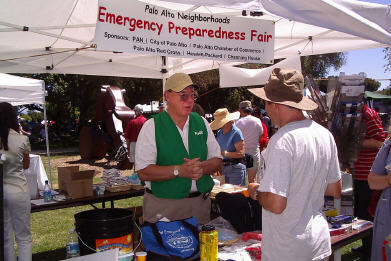 PAN organized an Emergency Preparedness Faire at this years Palo Alto chili cook-off to educate the public. We gave away brochures and basic items for a disaster kit and answered many questions. This was so successful that we intend to promote our booth at several events in the coming year. As a grass roots organization we are in desperate need of funding to proceed and are seeking donations and sponsors. This could be a great vehicle for local businesses or individuals that wish to strengthen or create a positive image in our community. If interested in becoming a sponsor, please forward your contact information to me at jspiller@cbnorcal.com and one of our committee members will respond. If you are concerned about Emergency Preparedness and have your own web site, why not post a similar page so your friends and clients can receive the benefits of this information?